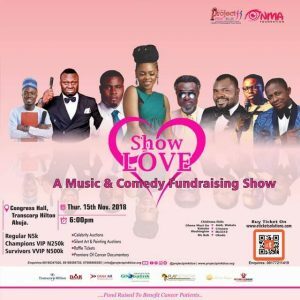 We are delighted to specially invite you “Show Love” a Music & Comedy Fundraising Show for Cancer Patients scheduled to take place on Thursday 15thNovember, 2018, 6pm at Congress Hall, Transcorp Hilton Abuja. Show Love is our new fundraising programme focused on encouraging and engaging Nigerians to financially support indigent people impacted by cancer. We can create awareness, provide screenings, oncology education, but, if we don’t provide financial support to cancer patients, then our circle of care is not complete and very few lives can be saved. Financing cancer treatment is very expensive and not affordable for millions of Nigerians. Hence, financial support to indigent cancer patients is extremely important to their survival. In 2015, a 35 year old lady with stage II breast cancer came to us for financial support for her breast cancer treatment, she needed N15million for the treatment of HER2 positive breast cancer. This breast cancer according to doctors is a very aggressive cancer, however, she needed a targeted therapy to treat the breast cancer after her single mastectomy (removal of one breast). 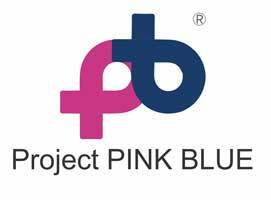 Project PINK BLUE started the fundraising to save this young lady’s life, but, it took us a year to raise the N15million in 2016, as at this time, her cancer has progressed from stage II to stage III- the breast cancer has spread from the breast to her lungs and brain. In this case, you can clearly see that she diagnosed her breast cancer early, but, because of funds she could not get treatment early. Our new programme is focused on raising funds and have a trust to support cancer patients and not to wait till the patients come and we start fundraising which may take more time. We appeal to you to attend the Show Love- Music & Comedy Fundraising Show, as a way to show love and support people battling with cancer in Nigeria.